It’s just past midnight on Friday, December 5th. I’m calling you from the Cayambe Hut at 4660 m/15,289ft above sea level, right at the base of the massive summit of Cayambe (5,800m/19,00ft). Cayambe is at 0 degrees latitude, it is the highest point on the equator. It’s a beautiful glaciated peak and it’s going to be our climbing goal today. Back on Wednesday when I last reported to you, we left the awesome Hacienda Cusin and drove to yet another hacienda where we will be staying after this climb. We dropped off our duffel bags full of travel clothes that we wouldn’t need and then began our drive up a long road towards Cayambe. 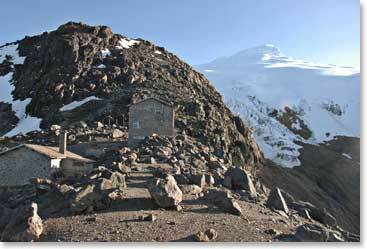 The van stopped at about an hours walk below the Cayambe Hut which is a large stone structure. It’s very comfortable inside; we have nice beds and a great kitchen. Our Ecuadorian chef is always in the kitchen cooking up great food for us. The first night we arrived we enjoyed a scrumptious asparagus soup, salad and tacos. We’ve been having french toast every morning for breakfast, including this morning when we woke at 11:30 p.m. to begin preparing for the climb. There is a light snow falling now so I don’t know what our visibility will be like as we climb higher and higher towards Cayambe. I know this team has been preparing their equipment, their muscles and their minds to ascend to 19,000ft on the Equator and will do very well. Wish us luck; we’ll give you an update of our attempt later on today.